Whether your pain is caused by arthritis, menstrual cramps, or backache, there is an over-the-counter (OTC) pain medication for what ails you. Most OTC painkillers fall into one of two classes: acetaminophen or nonsteroidal anti-inflammatory drugs (NSAIDs). Each type of pain medication has its own risks and benefits, although most have been used successfully for years and are well tolerated by most people. Some of these OTC pain medications can be formulated with other ingredients to offer additional benefits. For example, acetaminophen is available combined with diphenhydramine (to aid sleep) and is sold as Tylenol PM; Alka-Seltzer is a combination of aspirin and sodium bicarbonate, which neutralizes stomach acids. Because the variety of painkillers in the drugstore is enough to give anyone a headache, use the following guide to help you decide which is best for your needs. This drug blocks nerve impulses to the area of the brain that processes pain signals. Brand Names: Examples include Tylenol, Aceta, Actamin, Apacet, FeverAll, Panadol, Tempra and several "aspirin-free" drug formulations. Symptoms Best Treated: Fevers and headaches. Acetaminophen does not reduce inflammation, so it is not recommended for rheumatoid arthritis or other inflammation-related pain. Acetaminophen may also be easier on your stomach than other painkillers. Typical Dosage: Adults: 325 to 650 mg every 4 to 6 hours. Children: Recommended dosage is based on child's weight and varies depending on formulation (liquid, gel caps, and so forth). Follow manufacturer's recommendations or consult your child's physician. Important to Know: Acetaminophen is not recommended if you have a history of kidney disease, liver disease or alcoholism. Using St. John's wort may decrease the effectiveness of acetaminophen. This class of drugs reduces the body's production of prostaglandin, a hormone-like compound that sends pain messages to the brain. NSAIDs also reduce inflammation caused by injury or arthritis. Brand names: Bayer, Excedrin, St. Joseph's and dozens of other names. Symptoms Best Treated: Minor aches and pains from headaches, muscle aches, menstrual cramps, arthritis and aches from colds and flu. Typical Dosage: Adults can take between 325 and 650 mg every 4 to 6 hours. Children should not take aspirin because it is associated with Reye's syndrome, a potentially deadly condition. Important to Know: Aspirin, like all NSAIDs, can cause stomach pain or gastrointestinal bleeding. Use of enteric-coated aspirin and taking aspirin with food or milk may help alleviate this concern. 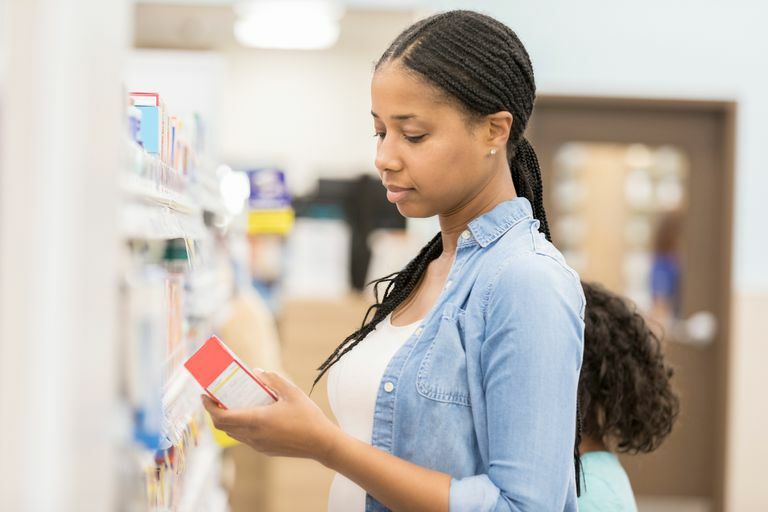 Women who are pregnant or breastfeeding and people taking anticoagulants, like heparin or warfarin, may want to consider another pain reliever. Brand names: Examples include Advil, Motrin, Addaprin, NeoProfen and Ultraprin. Symptoms Best Treated: Pain from arthritis, menstrual cramps, headaches, muscle pain and fever. Typical Dosage: Adults can take 400 mg every 4 to 6 hours. Recommended pediatric doses are based on child's weight. Follow manufacturer's recommendations or consult your child's doctor. Important to Know: Ibuprofen, like all NSAIDs, can cause stomach pain or gastrointestinal bleeding. Taking ibuprofen with food or milk may help alleviate this concern. Ibuprofen is not recommended for patients with lupus. Symptoms Best Treated: Arthritis pain and pain from menstrual cramps. Typical Dosage: Adults: 50 mg every 4 to 6 hours. Ketoprofen has not been adequately tested in children and therefore is not recommended for them. Important to Know: Ketoprofen, like all NSAIDs, can cause stomach pain or gastrointestinal bleeding. Use of enteric-coated ketoprofen and taking ketoprofen with food or milk may help alleviate this concern. Brand Names: Examples include Aleve, Anaprox, and Naprosyn. Symptoms Best Treated: Menstrual cramps, fever, headaches including a migraine, gout, and arthritis. Typical Dosage: Adults first take 500 mg, then 250 mg every 6 to 8 hours. For children, recommended doses are based on the child's weight. Follow manufacturer's recommendations or consult your child's physician. Important to Know: Naproxen should not be used during pregnancy or while breastfeeding. "Acetaminophen: Patient Drug Information." Uptodate. 2009. UpToDate, Inc.
"Health Bulletin: Use Caution With Pain Relievers." fda.gov. 30 Oct. 2007. Food and Drug Administration. "Over-the-Counter Pain Medication." millercenter.uchicago.edu. 13 Feb. 2007. Jack Miller Center for Peripheral Neuropathy, University of Chicago. "Pain Medications." Medlineplus. 8 Jun. 2007. National Institutes of Health. "Patient Information: Nonsteroidal Antiinflammatory Drugs (NSAIDs)." Uptodate. 15 Feb. 2008. UpToDate, Inc.